For the most part this is how your new garage will look. The numbered sections are individual areas, each with a specific purpose. 1: This is the menu button to access the game menu, and the server statistics, which were already covered. The number to the left is the number of players currently online and the number to the right is the amount of battles currently going on, not counting training battles. 2: This is the crew of your currently selected tank. Here, you can see some quick statistics, namely their experience percentage, rank, role(s), and name. You can access a more detailed menu by right clicking on their portrait. Left clicking on their portrait will bring up a menu displaying other crew members that can fill that role, allowing you to quickly swap crew members. 3: This is the Battle button. Clicking on this button will place you in a matchmaking queue using your currently selected tank. Clicking on the drop down menu allows you to choose between a standard battle or a training battle. It also has options to create a platoon or tank company. More information on these will come further into the tutorial. To the left of the battle button you can see the name and class of your currently selected tank/vehicle. To the right of it, you can see your nickname. 4: This is the Navigation bar. By default it is set to "Garage" and will display your garage as shown in the picture. Each of the other navigation buttons ("Depot", "Store", "Statistics", Tech Tree" and "Barracks") will be covered further into the tutorial. Premium account holders will receive 50% more Credits and Experience from each battle. In addition, they can have up to 3 people in a platoon instead of 2, and they can create companies. As a visual perk, premium players will have a garage that appears new, clean, and more spacious. Gold - Your current gold balance is shown here (the number to the left of the golden coins icon). You can purchase more gold using real currency by clicking on the "Get Gold" button. Credits - Your current credits balance is shown here (the number to the left of the silver coins icon). Credits are normally earned in standard battles. You can also trade gold for credits at the rate of 1 gold for 400 credits. Credits are also often referred to as "silver". 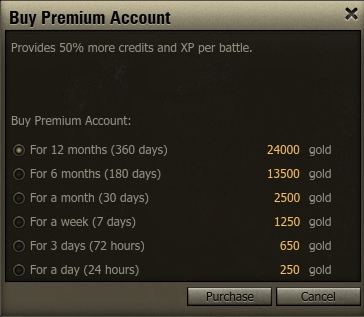 Free Experience - By default 5% of the XP you earn in any tank is credited to you as free experience. Free experience is experience that can be used to perform research on any tank, regardless of which tank it was obtained from. Once a tank reaches Elite status (all possible research on that tank is completed), you can convert any surplus experience into Free Experience using the "Convert Experience" button. The fee for this is 1 gold for every 25 XP converted. Only multiples of 25 can be converted. There is no way to buy free experience outright. 6: The Research button. The amount of XP available for the currently selected tank is shown to the left of the little star icon. The button opens your tank's tech tree, where you can spend the XP you've earned in that tank on research. Experience is earned by participating in standard battles. 7: These are the stats for your currently selected tank. Most of them are self explanatory but you you are looking for a more detailed explanation please visit any tank page in the wiki and read about them there. As you upgrade your tank these stats will update to reflect the modules on the tank. However, these stats do not reflect the training level of your crew. 8: This is the 3D model of your currently selected tank. 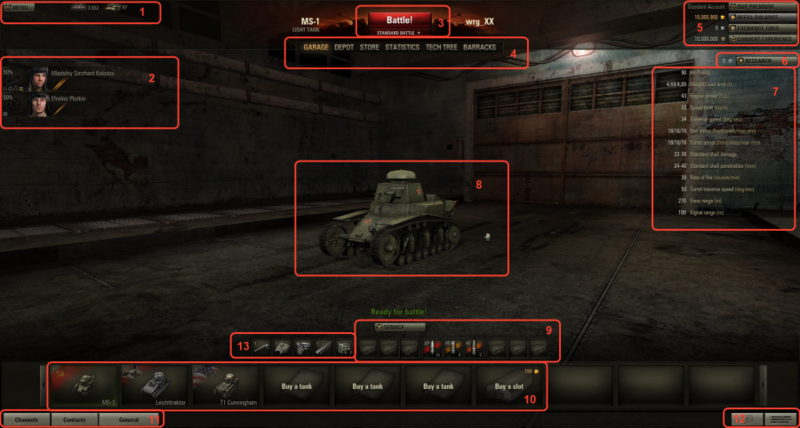 9: This is the section were your tank's equipment, ammo, and consumables are displayed. The "Service" button is used to access the Resupply menu. This will be developed further into the tutorial. All of your tanks and vehicles are shown here, ordered by nation and tier. If you wish to buy more slots, just press the "Buy a slot" button (it costs 300 gold). There is no limit to the number of tank slots you can have. If you have more tanks than will fit on your screen, you can navigate through your tanks by sliding the slots left and right. You can do this with the mouse or by using the left and right arrow keys. On the left side of the screen is a helpful filter box that allows you to filter your tanks according to various criteria (see picture). If you right-click on a vehicle and set it to "Primary", it will be moved to the beginning of the list. There is no limit to the number of tanks you can set as primary. Tanks set to primary will display according to the nation-tier order. 11: These buttons provide access to in-game communications. There are buttons that allow you to search for players and access chat channels. These are analyzed further into the tutorial. 12: These two buttons flash whenever you receive new notifications or system messages. The button on the left is the Notifications button. When clicked on, it will display a list of all recent notifications. Notifications are typically invitations to join a platoon, or if you aren't in a company, it will display any invitations you receive to join a company. The button on the right is the System Messages window. All system messages are displayed here, including error messages, battle results, credits spent, module and equipment changes, and so forth. 13: Last but not least is the modules display. These are the modules that you currently have fitted on your tank and directly affect your performance in battle. If you have unlocked new modules via research, click on these in order to purchase and upgrade to the next. This gets analyzed further into the tutorial.